As the days begin to shorten in the late summer and the first cool breezes of September tickle the air, the royal lady of autumn,Cattleya labiata, lowers her veil, smiles an infectious smile, and welcomes you to a new autumn season. She brings with her a dazzling array of large, delicate and beautiful lavender orchids that will grace the coming days from early September through the middle of November. She will be there for Labor Day, the children’s back-to-school rush, and the autumn house parties. She will be there for Halloween even though she isn’t orange or resemble a black cat. Cattleya labiata first stepped onto the horticultural stage 190 years ago when a wandering plant collector named William Swainson saw it in bloom in the Provence of Pernambuco in Northern Brazil and sent some plants back to Scotland to the Glasgow Botanic Garden. He asked the Botanic Garden to send a few of the plants to a tropical plant collector he knew in Barnet, near London. The man’s name was William Cattley. The year was 1818. The plants arrived in Glasgow on schedule and the Botanic Garden obligingly picked out some of the C. labiata plants and sent them to Barnet. If she had wanted an invitation to become a celebrity, Miss Labiata could not have been better treated. William Cattley had hired a young, 22 year old botanist named John Lindley to catalog the plants in his collection and Lindley wrote a book, Collectinea Botanica in which he described, in Plate 33, a magnificent new species of orchid. 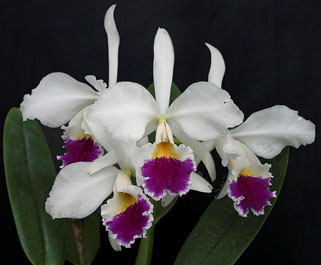 He called the new species Cattleya labiata and established a whole new genus, the genus Cattleya, based on the plant. Lindley’s book spread the word about Cattleya labiata throughout Britain and continental Europe and soon every hobbyist in the realm wanted a plant. Acquiring a plant, however, proved to be an impossible task. The problem was that no one knew where Swainson had actually found Cattleya labiata so commercial companies could not send their collectors to get more plants. Swainson had disappeared into the wilderness of New Zealand so no one could ask him – or even find him. Hunting for C. labiatabecame a thoroughly hopeless affair that rattled the whole horticultural world with missteps and fictions. It was over 70 years before someone re-discovered Cattleya labiata and ironically, the person who found it was not even looking for orchids. He was collecting insects. By the time C. labiata was re-discovered in 1889, almost all the large-flowered Cattleya species had been discovered and were growing happily in orchid collections throughout Europe and the United States. William Cattley and John Lindley had both died years before, and even the horticultural and botanical authorities who had guessed wrong on where C. labiata had been found originally were dead and buried. The bright image of C. labiata was so strong in the minds of horticulturists and orchid growers, however, that its rediscovery was hailed as the horticultural event of the year. By 1891, over 25,000 plants were being ripped out of the Brazilian jungle and imported into England alone. Many of the plants had magnificent flowers and you can still see the pictures of some of the best of these in old orchid books like Reichenbachia. Cattleya labiata is a wonderful species. Most plants have tall, strong pseudobulbs and are vigorous growers. They grow well at typical cattleya temperatures of 58F at night and 85 F during the day. They are very free-flowering, producing 4 or 5 blooms on a spike and the flowers are 5 to 6 inches across. The flowers normally last at least a month in bloom. C. labiata has a mild and pleasant fragrance and thin, delicate substance like the best large-flowered Cattleyaspecies and it is a very feminine flower. There is a wide range of color forms from pale lavender through rich, dark purple, and there are beautiful albas, semialbas, and coerulaes. It is as bright an addition to the fall landscape as the brilliantly colored leaves on the autumn trees. C. labiata normally begins growing in mid-January in greenhouses in the United States and, if it completes its growth by early June will make a second growth before buds begin to form in late summer. With two growths flowering at the same time, it can make a magnificent display. The species has a double sheath which occurs only in the Brazilian large-flowered species C. labiata and C. warnerialthough the double sheaths are slightly different in character in the two species. After the plant has flowered, it is best to keep it on the dry side until it begins sending out a new growth in January. Normal, regular watering when it is dormant will sometimes rot the roots. While it does not need much water during dormancy, it does benefit from lots of sun, and sun will help develop a strong lead when it does begin growing again. Cattleya labiata begins to form tiny buds in its sheath as soon as the days begin to shorten in late July. It is so sensitive to this shortening day-length, that artificially shortening the hours of daylight at any time of the year will cause it to form buds and flower. It is described as “light-controllable” by horticulturists because of this. When cattleyas were all the rage as cut flowers in corsages, whole greenhouses full of just C. labiata were grown in the United States. Commercial growers manipulated day-length to bring C. labiata into flower – autumn or no autumn. Many of C. labiata’s hybrids are also light-controllable and were handled the same way. There are no commercial greenhouses full of C. labiata now. C. labiata is strictly a hobbyist’s plant today, so it is very oriented to nature’s cycle of light which means when autumn comes, so does C. labiata. When Miss Labiata has finished her autumn dance and pulls the veil across her face again for another year, the winter winds will be stalking the landscape and the world will be turning cold and uninviting. For now, however, it is autumn and Miss Labiata is in full bloom with all the warmth and glow of her fabulous beauty.